Bonn, 9 October 2017 - For the upcoming CMS Conference of the Parties (CMS COP12), the Joint Communications Team of the CMS and AEWA Secretariat decided to try to break new ground by producing a rather unconventional publication by abandoning the standard format for conference brochures. Considering the “air, land and sea miles” that some of the migratory species on the CMS Appendices clock up on their vast migrations every year, what would be more appropriate to emulate than an airline Inflight magazine? “The idea was simple. Let’s use the format of a typical Inflight magazine to create a creative space to present a mix of content related to CMS and the upcoming COP and its theme” said Florian Keil, Coordinator of the Joint Communications Unit at the CMS and AEWA Secretariat. After this initial vision, several contributors joined the stage, offering articles, essays, community stories, photographs and even advertisements of their organizations – featuring content from across the wider CMS community – all made to look and feel like a typical Inflight magazine. “Take the map and fleet for example. Like every airline, CMS has an impressive fleet and we can show an impressive map similar but more organic than any route map typically found in a real Inflight magazine. It was a fantastic format to work with, but we clearly could not have managed such an ambitious project on our own” says Florian Keil. “Territory”, a professional and experienced design team from Hamburg, came on board and together the project took off. 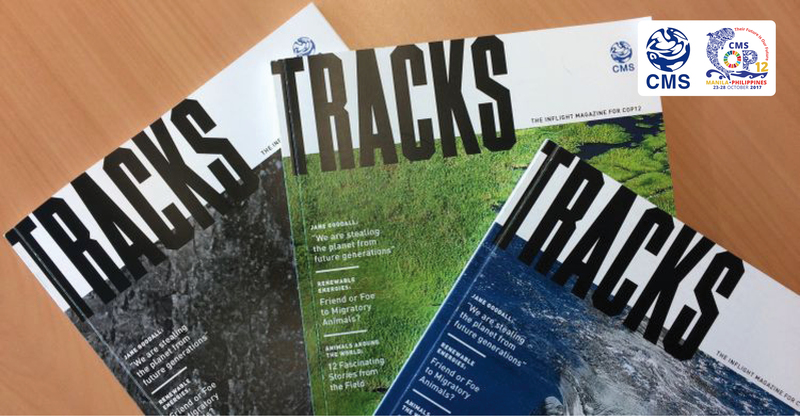 Weeks and weeks of team-work, meetings, and creative re-writing led to the creation of TRACKS, the Inflight Magazine for COP12. This 84-page magazine includes relevant and important content on migratory animals and issues relating to their conservation from across the wider CMS community. From stories on community conservation action on the ground, essays by organizations in the forefront of global conservation efforts, a zoom-in on three major issues surrounding wildlife, and interviews with well-known experts, this magazine will hopefully be of interest to those passionate about conservation of migratory species and get others interested as well. We are excited to start sharing the hard work and beautifully designed content of TRACKS with not only the conference attendees in the print version which will be handed out to those participating in CMS COP12, but to also publish a 104-page Extended TRACKS Online Edition in the run-up to the COP12 in Manila, from 23 to 28 October 2017. The special publication was made possible thanks to the generous voluntary contribution of the German Federal Ministry of the Environment, Nature Protection, Building and Nuclear Safety (BMUB).